How to subscribe to your website notifications? You can subscribe to your website notifications with just one click, simply by clicking on the “Add” button related to the desired destination. Receive notifications on your Facebook Messenger (on your computer or your mobile devices). Click on the blue button to subscribe with your Facebook account. You can subscribe with different computers/browsers, and with different Facebook accounts. Just like with emails, all the notification categories (Advice, Reminders…) are enabled by default. The notifications related to the blocks are automatically added, while inserting them into your website. You can disable them, by unchecking them in the control panel, if needed. When you receive a notification, you will have the possibility to click on a button, in order to be redirected to the management page related to the notification. For example, if you receive a notification about a new comment, you will be able, with just one click, to reach the comment management page. Pretty useful, isn’t it? 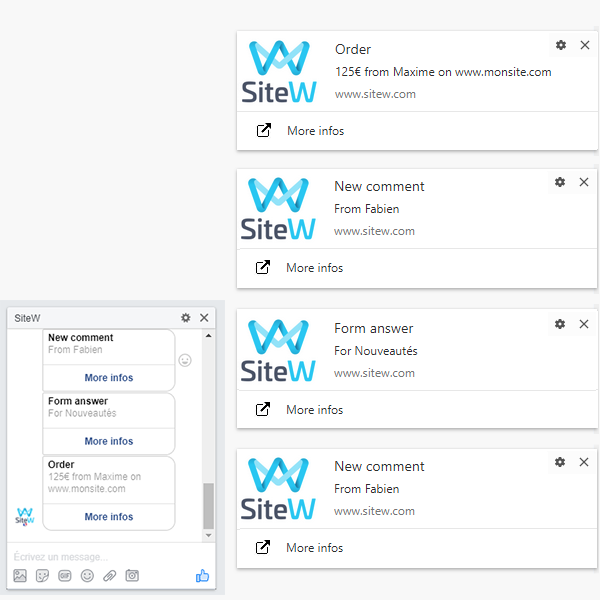 The notifications are sent to all the destinations registered on your SiteW account. But you can, just like with emails, unsubscribe, by clicking on the appropriate red cross, in the control panel related to notifications. The notifications give you the possibility to instantly receive all information about your website. That way, you will be able to manage it, more easily and conveniently!